I think we can all agree, 360 video is just about the coolest thing you've ever tried and failed to find an effective use for. It's been on the front line of Facebook's ongoing battle to become the prominent online video service. It's a battle they've yet to take the lead in, largely because they're competing with YouTube, who have what you could very charitably describe as a massive head start. 360 video has helped them stay in contention to some degree, but YouTube have it too, and there's little to differentiate them at this stage. That might all be about to change though, as on Tuesday Facebook will be rolling out a form of 360 live broadcasting. It's exactly as it sounds, enabling users to watching real-time videos in 360 mode, ostensibly making them more immersive. The logical progression from this will be live VR, which is really at the core of basically all of Facebook's machinations at the moment, it's the basket they're throwing all their eggs in. If you ask me, it's a flimsy basket, and it reminds me of all the Microsoft big-wigs who so confidently claimed that everyone would end up using Palm Pilots, or when Nintendo decided that motion controllers were the future of gaming. The longevity of VR notwithstanding, one aspect of it which could well take off is indeed live video. Imagine if you could have experienced Felix Baumgartner's orbital jump through his eyes, in 360 vision or even through a VR headset. 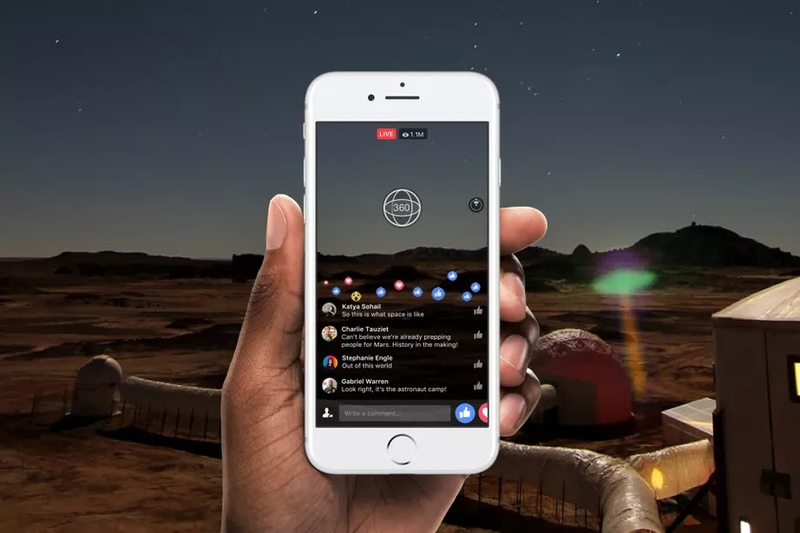 To the point, the first broadcast Facebook have earmarked for this feature will be a feed of 8 scientists emerging from isolated pods that they've been living in for the past 80 days to research how humans would cope with being transported to Mars. Viewers will also be able to take a closer look at the living quarters themselves, and even see what it feels like to don a space suit and take a ride in a rover. The space kind, not the shameful reflection on the lingering demise of British engineering kind. For the time being, the service is going to remain limited to only a few select pages, with an eye to expanding it from next year onwards. It's a wise move, giving them time to figure what the best way to promote/implement the feature is, and live video is a market Facebook have been able to corner quite effectively, so the changes of YouTube blasting past them are far lower.